I have always been fond of Barrick Design's candles but never knew who made them until the last gift show, when I scouted extra-hard and found them. 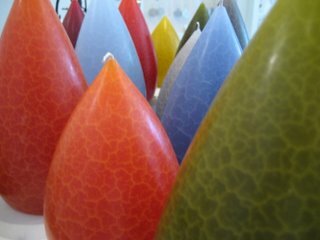 They are handpoured in Pennsylvania and have a pleasing, plump teardrop shape, and a crackle finish just under the very smooth surface. I have no idea how they do that. Anyway, the candles come in a trio of different heights and colors and they are unscented and if you can bring yourself to light them, the whole thing glows. Very pretty. I am restocked on the Coffee for Ones in all 4 colors, and on celadon Beehouse teapots. I am awaiting more Polli jewelry - the price is going up a little bit with the new arrivals. Same on new Beehouse - everyone adjusted their prices up so I must pass it on, sorry about that. It's just by a couple dollars in most cases. Items I've picked for Jill Bliss' show are starting to arrive too, don't forget it opens the first week of October. We are conducting the Fall fashion shoot this weekend so next week you'll get to see what else is going on at Rare Device! We will be presenting new items by Talla, Paper Bird, Nisa, Umsteigen and lots of bags and jewelry too. I think we'll add some hats and scarves as well - it is very fall weather here in Brooklyn, and the breeze is up, and suddenly I want to wear sweaters and light scarves. That's kind of fun. OK, the tradeshows - maybe it's due to attending on day one but there was a definite spirit of optimism going on and the spring stuff looks great. There are tons of dresses still and yes, volume - but that means a more forgiving cut that will work for many body types. We have ordered some cute new clothing lines but what I am really excited about is our first watch. It is unisex and very limited edition and plastic (!) and I will put it on the website for pre-orders when I get more photos and information for you. It is definitely a Rare Find. Today's listen: Mouse on Mars 'Idiology' and Joshua Bell/Edgar Meyer 'Short Trip Home'. No, they really don't go together at all.